Abu Bakr al-Baghdadi’s Islamic State continues to operate throughout Syria, including in the northwestern province of Idlib. 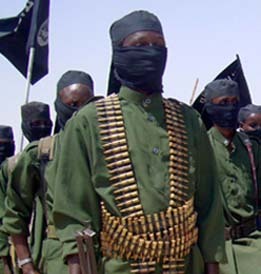 The group has claimed a series of plots targeting its jihadist and Islamist rivals in recent weeks. 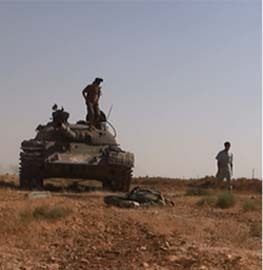 The attacks are centered in Idlib province, including its capital city, but have spilled over into the countryside and neighboring provinces as well. 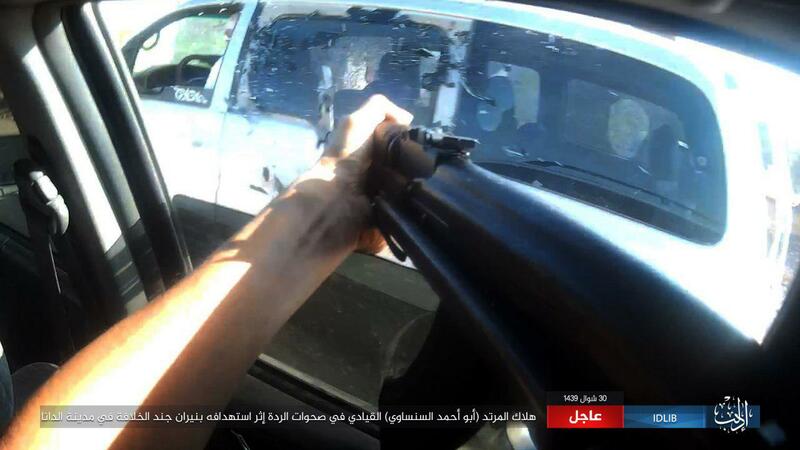 The Islamic State’s propagandists have named the operations after Abu al-Baraa al-Saheli. 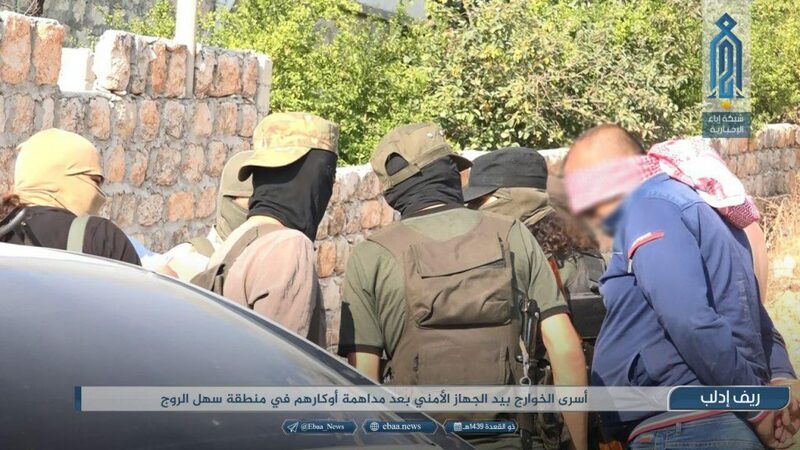 Hay’at Tahrir al-Sham (HTS) executed al-Saheli after detaining and accusing him of orchestrating a coordinated assassination campaign against HTS and other actors. 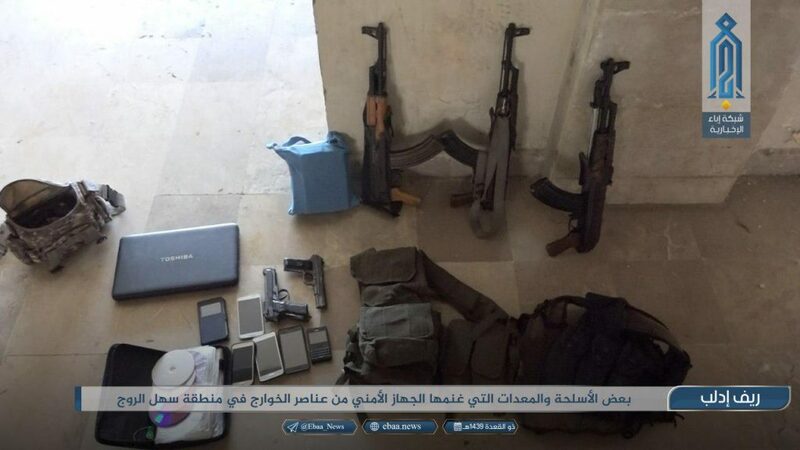 HTS is the largest jihadist group in Idlib, which was seized in 2015. The ideologues hope to transform Idlib province into an emirate ruled under sharia. But HTS and its closest allies have suffered a string of setbacks and are relying on Turkey to save their proto-state from a possible invasion by the Assad regime, Russia and Iran. In addition, HTS has been fighting against its own longtime allies, including ideologically similar groups that are also opposed to the Assad government and the Islamic State. The Islamic State’s clandestine apparatus has further complicated life for HTS and others. 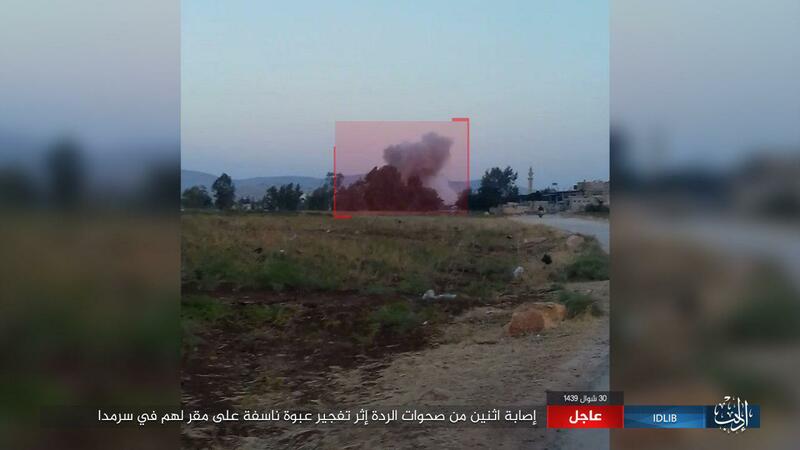 On July 12, Abu Bakr al-Baghdadi’s media team produced three images from an improvised explosive device (IED) attack in Idlib city. The target was Sheikh Anas Ayrout, a longtime opposition figure and senior sharia official who has been part of the nascent governance efforts in northwestern Syria. 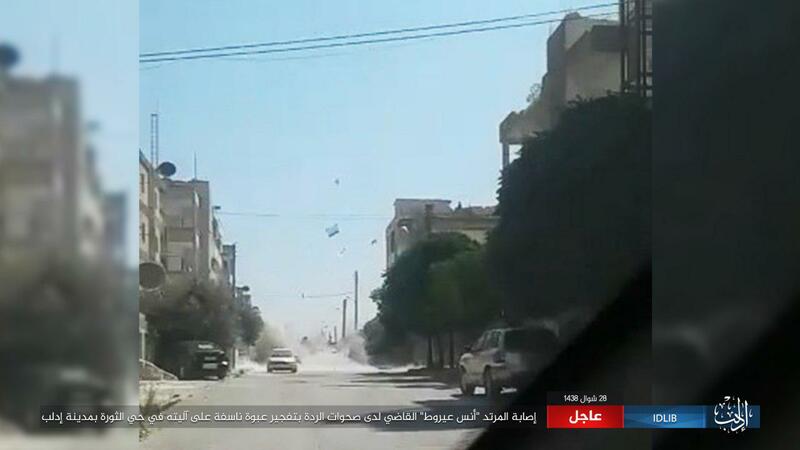 A photo from the IED bombing can be seen below. Initial reports indicate that Ayrout was injured, but survived the attack. 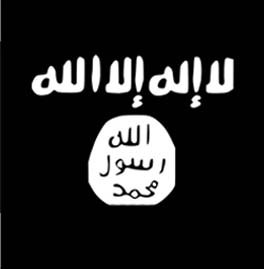 Still, it is telling that the Islamic State could target such a high-profile individual. It does not appear that Ayrout was accidentally struck. 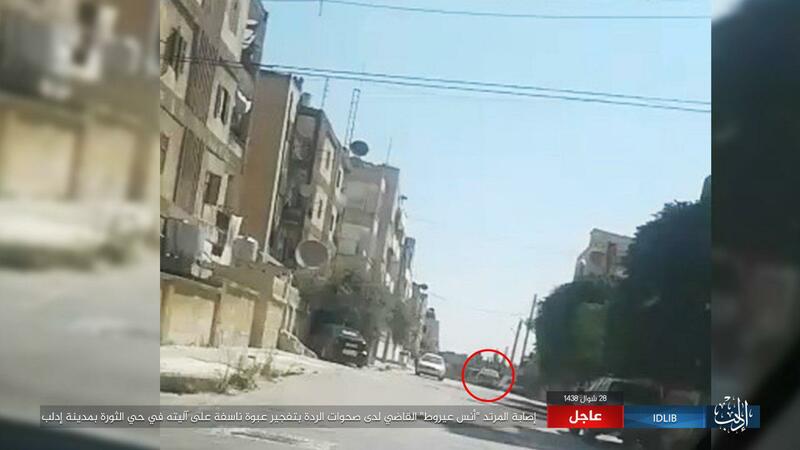 Instead, Baghdadi’s men identified Ayrout’s car, tracked it and placed an IED along its route. A targeted attack of this kind requires a sophisticated network of cells deep inside the heart of HTS’s primary redoubt. 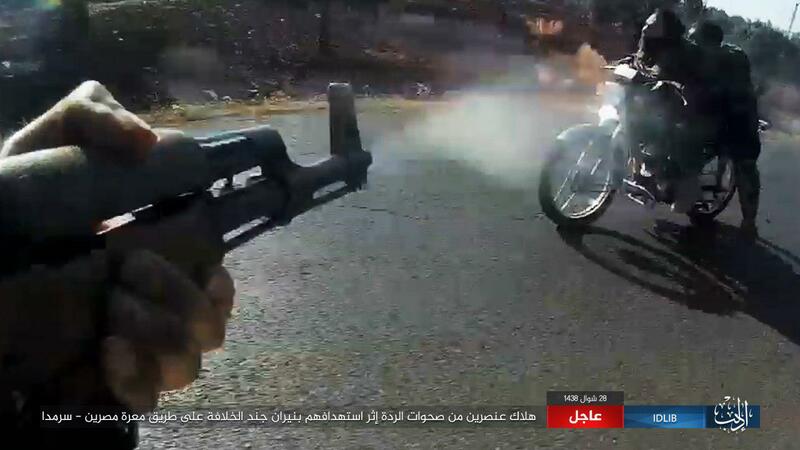 On July 13, the Islamic State released three more photos documenting the assassination of Abu Ahmed al-Sansawi in al-Dana, Idlib. According to reports on social media, al-Sansawi was a leader in the Sultan Murad Division, a rebel group that took part in Turkey’s operation in Afrin. Once again, the killing appears to have been a targeted assassination — not a haphazard drive-by shooting. 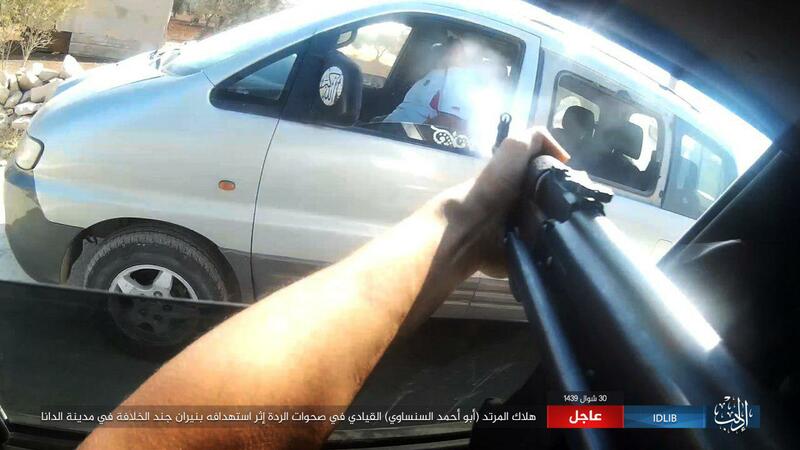 One of the pictures released by the Islamic State can be seen below. 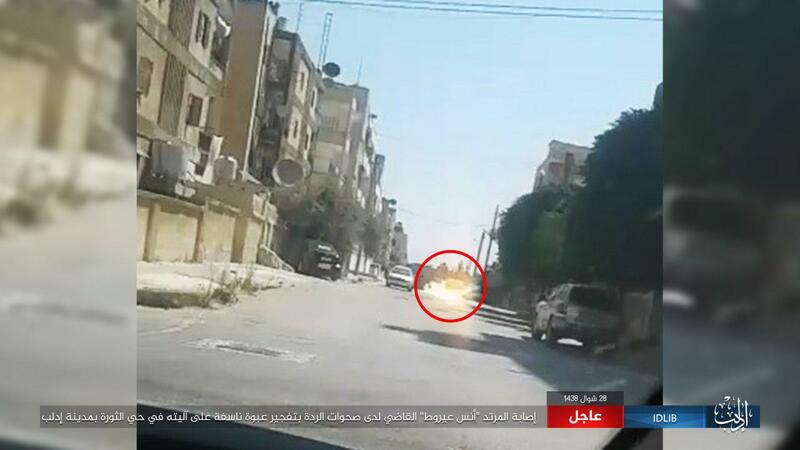 Two other images released yesterday show an improvised device explosion underneath a vehicle driven by “apostates” in the town of Sarmada. 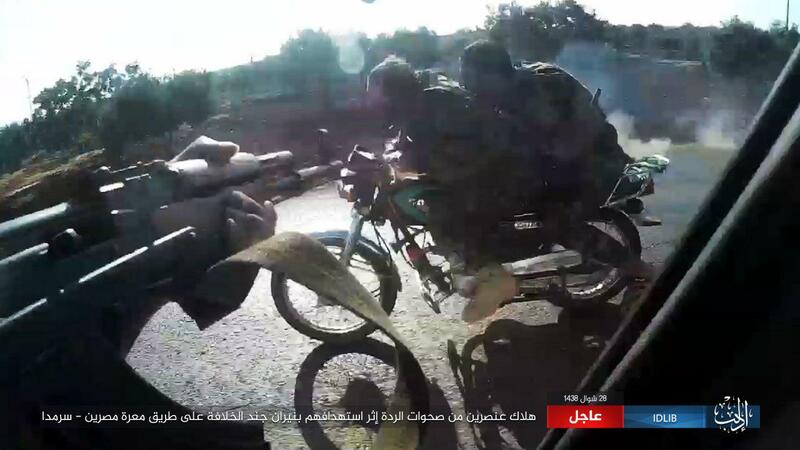 Other images and statements produced between July 10 and July 13 include: pictures of a gunman attempting to assassinate two individuals riding on a motorcycle, three photos of another IED attack on rival insurgents, and a grisly photo of two men who were decapitated in Maarrat al-Nu’man. The Islamic State’s Amaq News Agency has also published a string of reports claiming that various HTS officials and members have been hunted in recent days. 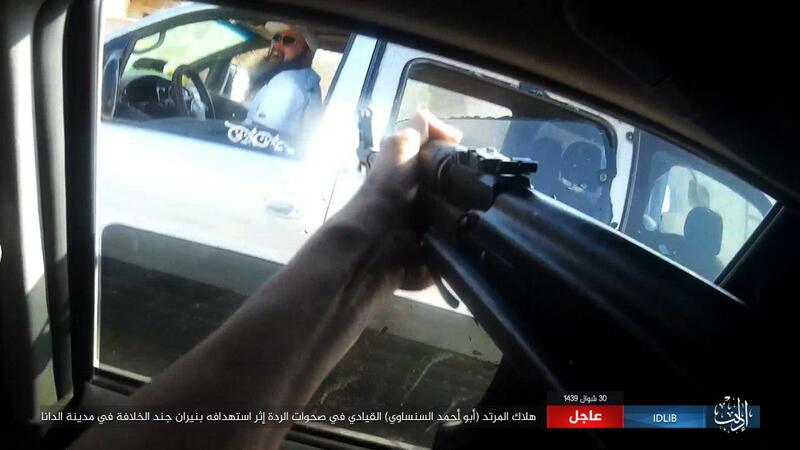 Some of the images are recorded with cameras positioned close to the action, demonstrating that the self-declared caliphate’s men are operating well behind enemy lines. 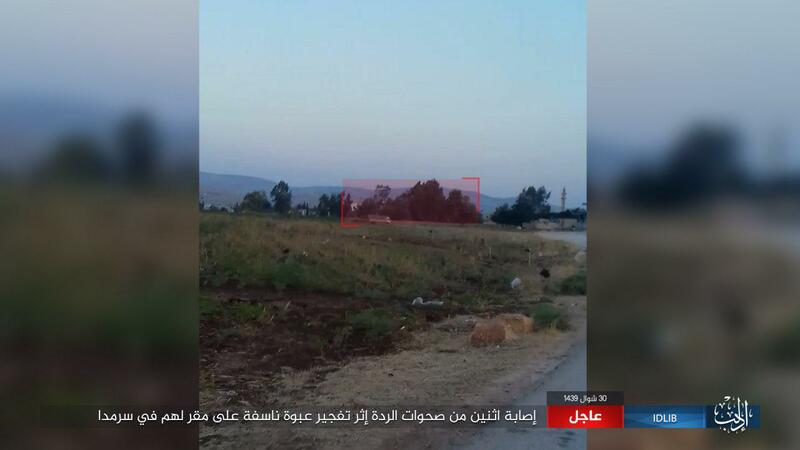 HTS has attempted to combat this intrusion on its turf with a security campaign, detaining alleged Islamic State cells and sweeping various areas for IEDs. Like other jihadists opposed to Baghdadi’s caliphate project, HTS refers to the Islamic State’s men as “Kharijites,” a reference to an early Islamic sect that is most often identified with extremism. 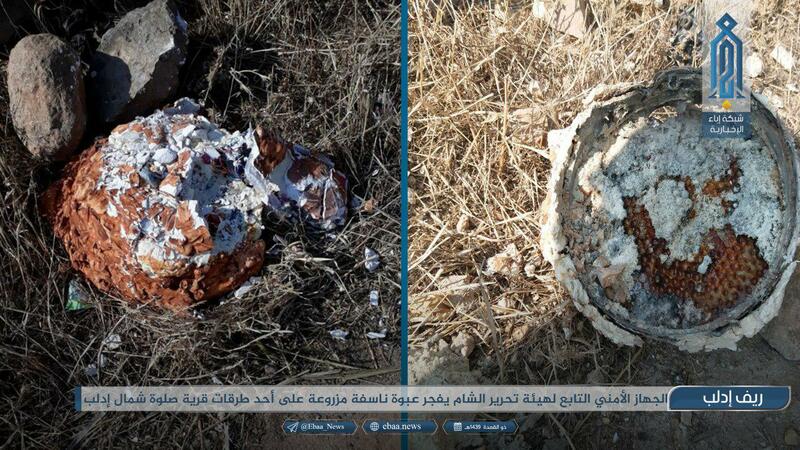 Several photos from the HTS security campaign can be seen at the bottom of this article. 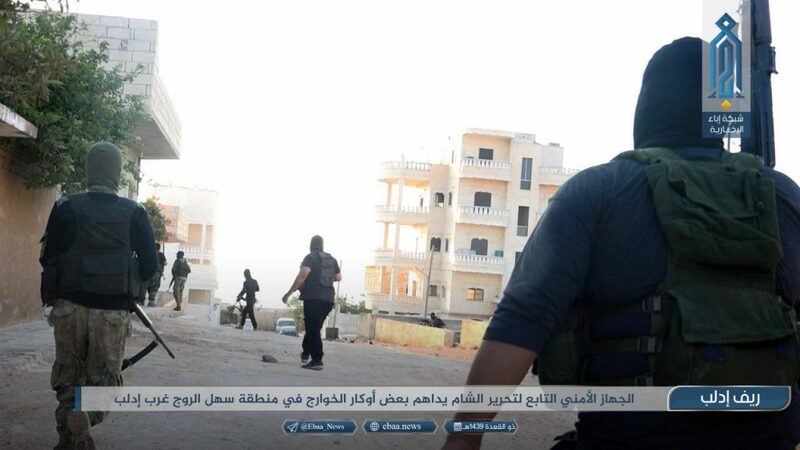 While the Islamic State campaign inside Idlib seems to be focused and intense, it is not new. Baghdadi’s representatives have repeatedly targeted HTS, as well as others in northern Syria. 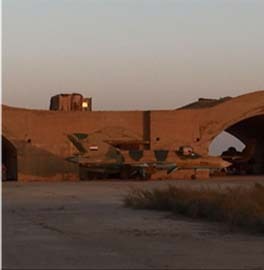 And HTS has failed to root out its rivals’ presence despite persistent efforts. 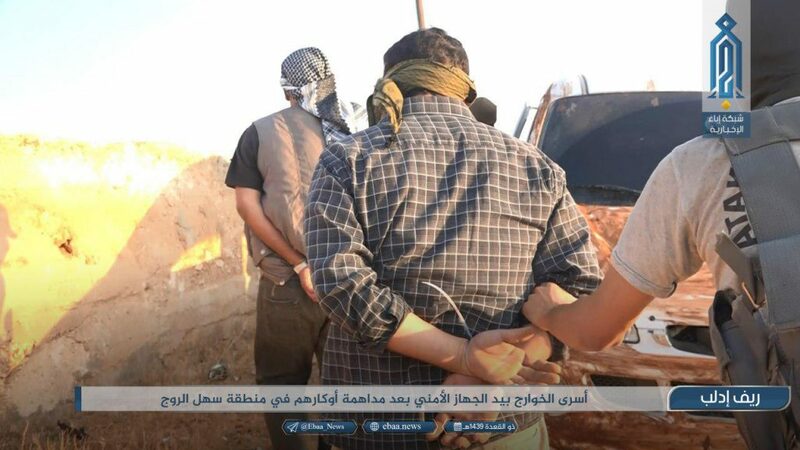 Since mid-2017, HTS has issued multiple reports claiming that various Islamic State cells had been detected and detained. Yet, more than one year later, Baghdadi’s cells continue to pose a problem. In June 2017, Sheikh Abdallah Muhammad al-Muhaysini survived an assassination attempt after attending Friday prayers at a mosque in Idlib. It wasn’t clear at the time which party was responsible, but some online jihadis claimed an Islamic State member was the culprit. 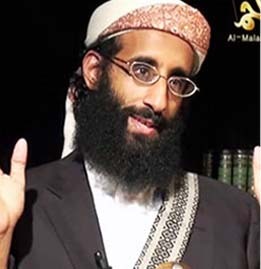 Others within HTS have also opposed Muhaysini, a US-designated terrorist with links to al Qaeda. The Saudi cleric subsequently renounced his position in HTS. In April, the Islamic State’s Damascus “province” released an 18-minute production titled, “So Will They Not Repent to Allah.” The entire video was an attempt to undermine the ideological legitimacy of HTS and al Qaeda. In addition to the attacks in Idlib, the so-called caliphate has also fought HTS in Hama, the Yarmouk refugee camp outside of Damascus and elsewhere. 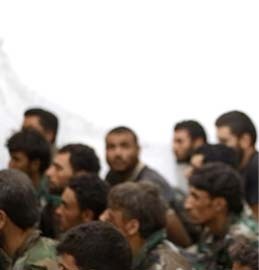 Thus far, there is no sign that the Sunni jihadists are reconciling to fight their common enemies. The unfathomable wonders of Islam. I knew what getting involved in Syria would entail …..What a mess.